The interaction between typhoons and the North Pacific subtropical high and the associated remote impact on East Asian and North Pacific anomalous weather during the Baiu/Meiyu season have been investigated using the Japanese long-term Reanalysis project data aided by the Japan Meteorological Agency Climate Data Assimilation System. The typhoons that appeared in July have been categorized into two primary tracks, the Hainan Island course (HC) and the Okinawa Island course (OC). 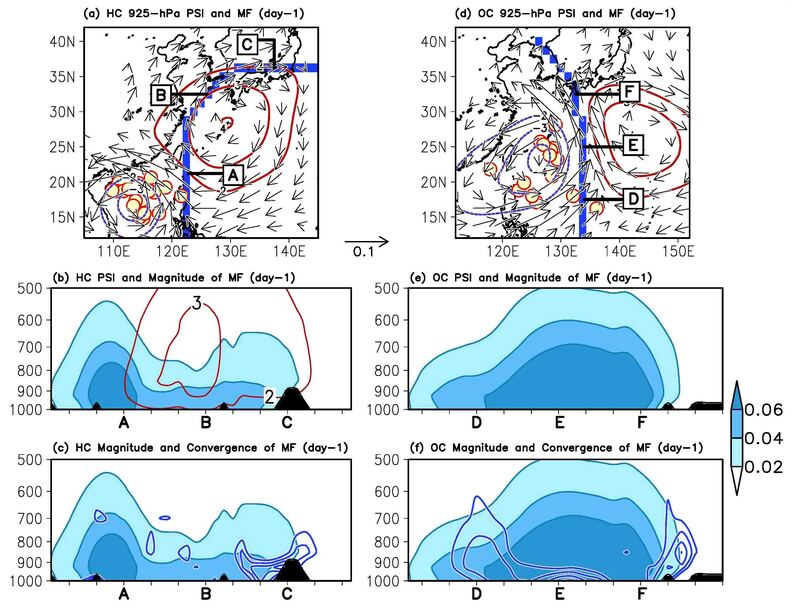 A typhoon gives rise to negative absolute vorticity advection along its eastern periphery, which locally reinforces the western ridge of the North Pacific subtropical high, whereas the resultant anomalous high stimulates the westward (northward) migration of the HC (OC) typhoon through its combination with the background flow. A combined effect of the typhoon and its induced anomalous anticyclonic circulation increases the transportation of moisture into the Baiu/Meiyu frontal zone in the vicinity of Japan. Over the East China Sea and the Sea of Japan, northward or northeastward moisture flux is pronounced along the western periphery of the typhoon-induced anticyclonic circulation anomaly in the HC category, triggering heavy rainfall on central Japan's Sea of Japan coast. Similar remote effects also operate in the OC category, which is responsible for the occurrence of extremely heavy rainfall along the Pacific coast of western Japan. When an OC typhoon approaches the Asian jet, it is capable of giving rise to anticyclonic vorticity within the jet, leading to the downstream development of stationary Rossby wave packets via the North Pacific waveguide. Fig. 7 (a) Composite map of filtered 925-hPa stream function (contours) and moisture flux (vectors) anomalies on day -1 for category HC. The contoured interval is 1.0×10^6 m^2 s^-1. Anomalies of less than 2.0×10^6 m^2 s^-1 have been suppressed. The reference arrow is 0.1 kg kg^-1 m s^-1. Fluxes of less than 0.01 kg kg^-1 m s^-1 have been suppressed. Day 0 denotes the day of maximum development of the typhoons. The location of the typhoons is also shown with circles. (b) Height-section map of stream function (contours) and magnitude of moisture flux (shaded) anomalies along a thick line (labeled A, B, and C) in Fig. 7a. The contoured interval is 1.0×10^6 m^2 s^-1. Anomalies of less than 2.0×10^6 m^2 s^-1 have been suppressed. The shaded interval is 0.02 kg kg^-1 m s^-1. The black-shaded region represents the topography. (c) The same as in (b) but for anomalous moisture flux convergence (contours). The contoured interval is 1.0×10^-8 kg kg^-1 s^-1. Anomalies of less than 1.0×10^-8 kg kg^-1 s^-1 have been suppressed. (d) The same as in (a) but for category OC. (e) The same as in (b) but for category OC. The height-section map is made along a thick line (labeled D, E, and F). (f) The same as in (c) but for category OC.